Question to ask, tips & insights so you don’t get ripped off. So you have decided you need to rent a dumpster for your residential or commercial project? No matter how big or small your project is, there are many things to consider when making this important decision. Horror stories abound from people who have had bad experiences renting a dumpster. At it’s core, it should be a simple process. But it’s not as simple as many people might imagine. With a little preparation and understanding the right questions to ask, renting a dumpster can be very simple. This report will cover the essential aspects so you can be prepared. Asking the right questions could save you hundreds of dollars, damage to your property, personal injury and more. This is not always easy. Especially for a home owner who is not a professional contractor. Maybe you just need to get rid of a basement and attic full of junk. You don’t want to make 20 runs to the dump so you choose to rent a dumpster. Where many people find themselves in trouble is underestimating or over estimating the weight. If you rent a dumpster that is too small for the job, you may pay less up front, but in the end you will still have junk or need to rent another dumpster. Rent a dumpster that is too big and you will over pay up front. The more information you can give the rental company, the better. At Advanced Roll Off, we ask the right questions so we can get the best idea of the size you will need. Make sure whoever you rent from is asking the right questions. It is not enough to ask if you know what size you need. The company needs to ask what type of job you are doing. For instance, if you’re doing your roof, they should be able to estimate what you need by the size of your roof. How much will they charge for overages? The dirty little secret of an unscrupulous dumpster rental company is called ‘Overages’. This is where they make a ton (pardon the pun) of money off of unsuspecting renters. Some companies may tell you that a roofing job would need a $350 for a 12 yard dumpster with 1.5 tons but then because of the weight, you find out later it is going to actually cost $800. That’s hundreds of dollars you didn’t plan to spend! Once your dumpster had been filled and hauled off, you’re hooked. They’ve got you. You have no choice but to pay them what they want or unload your dumpster. You need a person who will be upfront. Someone who will be honest of what your price really will be, not just with a simple fee to get their foot in the door making it sound low. But someone who will be honest and straightforward up front. Does the company offer flexible options? An unscrupulous company may give you a low price up front knowing that you will end up paying more in the end. Beware of prices that seem too good to be true. The number one concern should be that you have the right sized dumpster for the job, not a low ball price. Problems arise when a person rents a small 10 yard dumpster for $300 but really needed a 20 yarder. Even though they thought they got a great price, they end up spending double because they have to rent a second one. If they were quoted the right size dumpster in the first place, they would have saved a lot of money. 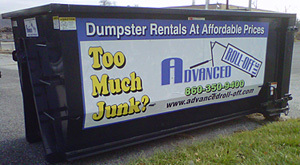 Advanced Roll Off has a flexible dumpster rental for people who are not sure the size they need. We charge a lower flat fee for any size dumpster and then the renter simply pays for the weight they use. This flexible option helps alleviate the stress of having to cram everything into a dumpster too small or have extra space you’re paying for. This protects our renters so they have something that’s big enough without having to pay extra for it. 3: Dumping fee per ton. Where will the dumpster go? Make sure the dispatcher knows exactly where the dumpster should go. Imagine if they drop the dumpster in front of the garage and then you can’t get your car out in the morning? Do you need to set it in the door? Can I open it? Is the company willing to address issues when they get to your project site? Or will they just leave the dumpster wherever it lands? Advanced Roll Off will never leave a dumpster where it shouldn’t go. If we don’t do our job understanding this up front, it’s our fault and we’ll fix it. If a truck is too big for your site you can end up with lawn damage, tree damage or worse. Make sure the company you choose won’t just jam an oversized dumpster onto the job site just to move on to the next customer. Or a truck that’s too heavy for the property. How old is the equipment and how is it maintained? Old equipment can have numerous problems. This can cause your job to be difficult if not dangerous. If the equipment is old it can get jagged edges that can rip clothing or worse; your skin. Old trucks can leak oil and hydraulic fluid onto your site. On older equipment you may not be able to open the door properly which means everything must be thrown over the side. Some companies want to keep them on the job site and then moving from site to site. So they don’t take the time to properly evaluate and repair them to keep them in top shape. Advanced Roll Off maintains only newer dumpsters. They also have a mechanic on staff who repairs all dumpsters. They get repainted regularly so they don’t rust. All dumpsters are fully inspected on a yearly basis. It is top priority to send out only good equipment. How long will it take to get the dumpster and to get rid of it? Make sure to ask how long it will take to get your dumpster and how long it will take them to pick it up. If, for example, you are cleaning out your house because you’re moving, the last thing you would want is having the dumpster still there filled with garbage on closing day. Advanced Roll Off will drop off and pick up within 24 hours or swap out with 12 hours notice. Asking all of these questions before you make your decision can make this a simple, pleasant and cost effective experience. We hope this guide has helped you!